St Peter's Church has Saxon material within its structure, although it is difficult to say whether it is a pre-Conquest or early-Norman church. The parish covered the settlements of Clayworth and Wisetown as well as surrounding countryside. 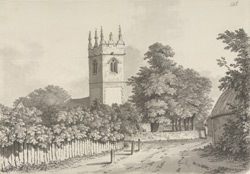 The village of Clayworth also had a free school founded in 1707 by Rev. William Sampson, and a Wesleyan chapel built in 1834.